In the nearly 40 years that they've been working together, Penn Jillette & Teller have accomplished a great many things. Thanks to their skillful blend of cynical showmanship & macabre magic, these two have traveled the world over, had hit shows both on & off Broadway, made numerous TV & film appearances, written best-selling books as well as starring in their own long-running Las Vegas revue. Which would have probably been enough for most performers. But not Penn & Teller. For years now, their fans had been clamoring for these two to do produce some sort of seasonal spectacular. A Halloween maze or haunted house that perfectly captured this team's twisted sensibilities. "That's something that I've honestly been longing to do for decades now," Teller explained during a recent phone interview. "But the sheer logistics of doing something like that -- Where should we build this haunted house? How should we market it? -- were just too daunting. It wasn't the sort of project that we were willing to tackle all on our own. So that idea just sat on the shelf." Until earlier this year, that is. Which is when members of Universal Orlando's creative team invited Penn & Teller to lunch and then asked Penn & Teller if they might be interested in collaborating on a concept for this year's Halloween Horror Nights at Universal Studios Florida. "I initially thought that the real reason Universal was asking to meet with us was because they wanted us to do a show at the park. Which -- to be blunt -- wasn't really something that I was interested in doing," Jillette admitted. "But as soon as they said that they wanted to build a Penn & Teller-themed maze, what was supposed to have been a one hour-long lunch quickly became a three hour-long lunch, as we all began chiming in with ideas and gags we could pull inside of that haunted house and maze." And given that Penn & Teller have been working in Las Vegas for 11 years (not to mention calling Sin City home for two decades now)... Well, what better way to pay tribute to their hometown than to make it the subject of the first-ever Penn & Teller-inspired Halloween Horror Nights maze? "The basic premise of this maze is that Penn & Teller were onstage doing a trick in their Las Vegas act which involved a nuclear warhead but then something went horribly wrong. Now the entire city is covered in nuclear waste -- the showgirls, the slot machines, the little wedding chapels, the all-you-can-eat buffets -- but we're trying to convince everyone that it'd no big deal. You can still have a great time in this nuked version of Las Vegas. So that's what our maze is really all about. 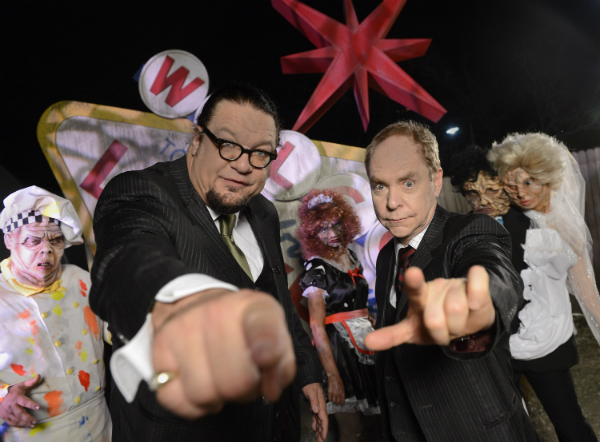 Penn & Teller take you on a tour of the irradiated version of Sin City," Teller laughed. And much to the delight of the creative executives at the Universal Orlando Resort, Penn & Teller have proven themselves to be very enthusiastic collaborators. Though it's barely been eight months since this team was first asked if they'd be interested in having their very own haunted house at this year's Halloween Horror Nights, they've already made numerous trips to Central Florida to meet with this show's writers and designers to fine-tune things. And earlier this week, these two actually toured the "Penn & Teller New(kd) Las Vegas" construction site before they then went into the studio to record numerous video segments and voice-over pieces which will then be presented nightly inside of this particular HHN haunted house. "Not only that, but Penn & Teller have actually been talking about coming back to Orlando several times over the course of this year's Halloween Horror Nights event so that they can then appear unannounced inside of their maze. So that they can personally get in on scaring the people who are going through their haunted house," said Jim Timon, Senior Vice President of Entertainment at the Universal Orlando Resort. "That's how excited Penn & Teller are about having their very own maze at this year's event." "You have to understand that this is kind of a fulfillment of a dream for me," said Teller. "Back when I was a kid in Philadelphia, my family and I used to stage these elaborate Halloween displays. When you came trick-or-treating to our house, you really had to earn that candy. My family deliberately tried to scare the crap out of kids whenever they came to our house for Halloween." And Teller had so enjoyed scaring people like that -- back in 2010 -- that he and magician Todd Robbins actually produced an off-Broadway show called Play Dead, which recreated those illusion-filled spook shows that used to be presented back in the 1930s & 1940s. "So after having done that, to now be involved with the people at Universal and building this elaborately themed maze that thousands of people will be going through every night, laughing and screaming at all of these Penn & Teller-specific gags that we've set up, it just doesn't get any better than that," Teller enthused. "Not only that, but in our maze, there's going to be this point where the audience then gets the opportunity to become a member of the cast. Where you're actually going to get the chance to get in on the fun and help frighten the very next group of people who come into that room," said Penn. "It's going to be great." The "Penn and Teller New(kd) Las Vegas" haunted house will debut late next month when Halloween Horror Nights 22 officially opens to the public on September 21st. This seasonal event will then be presented at Universal Studios Florida on selected nights through October 31st. Jim Hill is an award-winning entertainment writer who lives in New Boston, NH. Over the past 30 years, he has interviewed hundreds of veterans of the animation & themed entertainment industry and written extensively about The Walt Disney Company. Jim is currently working on a behind-the-scene history of the development & construction of Disneyland. For his more immediate musings on movies, TV shows, books and theme parks, please check out his blog, jimhillmedia.com.